A very old Seth Thomas clock that I own. The wooden works are fascinating. Came to me as an inheritance and spent most of its life in a cottage on Nantucket Island. I have done a little research. The label, printed by Hudson & Skinnerit, dates it to pre 1839. Other than that I know very little about it. And yes! It is still ticking! I also have a Seth Thomas clock almost identical to yours. Mine has an eagle at the top. The weights are iron. And I believe the pendulum is iron. It still has the paper on the back. I inherited it from my dads relatives back in 1978 and they were very old then. I was told when I got it that it was very old. I know nothing about this clock except it has all wooden gears also. Your clock is a beautiful example of an early Seth Thomas. I believe that this design, called split-column, or half column was patented by Eli Terry in 1830. If anyone knows differently, let us know. Thomas made these and other wood works clocks until he saw that the cheap brass clocks were the wave of the future. 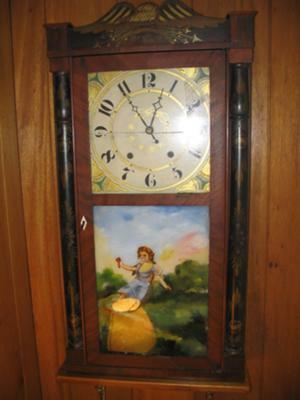 Seth Thomas started making brass clocks about 1842, and ceased production of wood clocks in 1844. The fact that your clock is still running after 170 years, and with wood gears, is amazing to me.